The Bobcats are rolling, have one of the best quarterbacks in the state, and a date with longtime foe Canadian on the horizon. Childress has always been known for being a physical football program, so it’s no surprise that coach Jason Sims pointed to the team’s physical nature as one of the key reasons the Bobcats are off to a 5-0 start this season. But Sims, who graduated from Childress in 1993 and played under legendary coach Charlie Johnston, said this may be the most physical team he’s coached since returning to his hometown. Sims said part of the increase in physicality stems from the team having more size this year to accompany the physical mentality that’s been synonymous with the program over the last several years. Childress has a second team all-state senior to lead the way on the offensive line in Tanner Mills while junior Carson Lambert headlines a talented junior class that features the size Sims is excited about in the trenches. Defensively, three-year starter Isaiah Darter – who stands at 6’3, 200 lbs. – sets the tone for the rest of the unit by flying all over the field and utilizing what Sims described as a vicious style of play. Darter has 60 tackles, four sacks, six TFL and a defensive touchdown through five games. Morgan Holcomb has been an important part of the success as well, posting a team-high 79 tackles and three for loss from his spot at middle linebacker. With wins over Bushland, Perryton, Panhandle, Eastland and state-power Muenster, the Bobcats stingy defense is allowing 21.8 points per game entering this week’s showdown against Friona on Friday night. On the offensive side of the ball, senior quarterback Luke Latimer leads the way again this season after earning second team all-state honors a year ago. Latimer has thrown for 1,511 yards and 12 touchdowns while chipping in 356 yards and eight scores on 62 carries. Haggan Lott (21 catches, 414 yards, five TDs), Trent Willis (23 catches, 376 yards, three TDs), Darter (13 catches, 323 yards, one TD) and Stephon Harris (14 catches, 151 yards, one TD) have served as Latimer’s top receivers this year. While the offense is averaging 39 points per game, the Bobcats have turned the ball over 16 times so far this season – an area that will continue to be a point of emphasis as District 1-3A Division II play progresses. As good as Lott, Willis and Harris are offensively, the trio has also shined in the secondary where they have three interceptions apiece on a defense that’s forced 19 total turnovers and has scored five touchdowns thus far. The Bobcats will look to continue to add to those numbers when they take on a 4-1 Friona tomorrow night in the district opener. 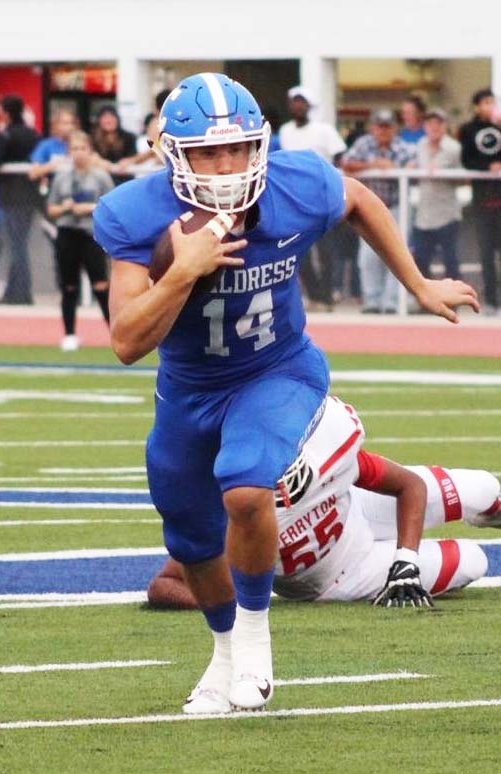 Childress will travel to Canadian next week, looking to avenge a pair of losses last season – including one in the fourth round of the playoffs – while also setting the team up for a run at the district title. “I don’t know if there’s much of a revenge factor,” Sims said. “They were just a better football team than us last year. They were dominant against us on the line of scrimmage in both games and I think it’s going to be a little more evenly matched this time around.